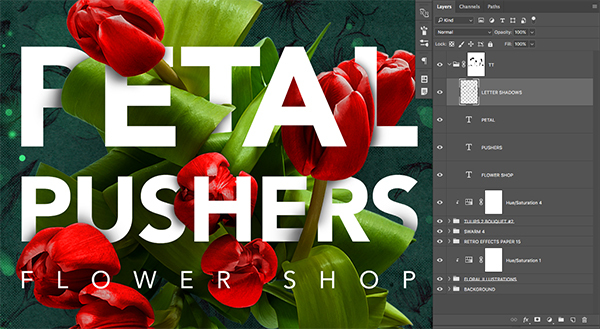 In this design tutorial I will be showing you how to create a cool flyer design for Petal Pushers Flower Shop using some of the elements from the latest design bundle. 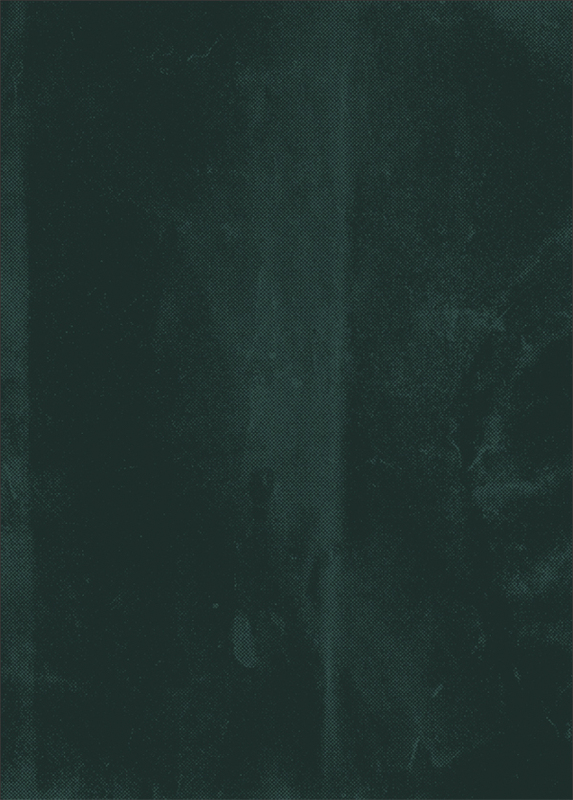 We will be combining various textures, illustrations, and photography with type to create a unique and eye catching layout. Let’s get started! This freebie pack includes some amazing design resources from Annie Sauvage, Roman Jusdado, Vector-Hut and Retro Supply! 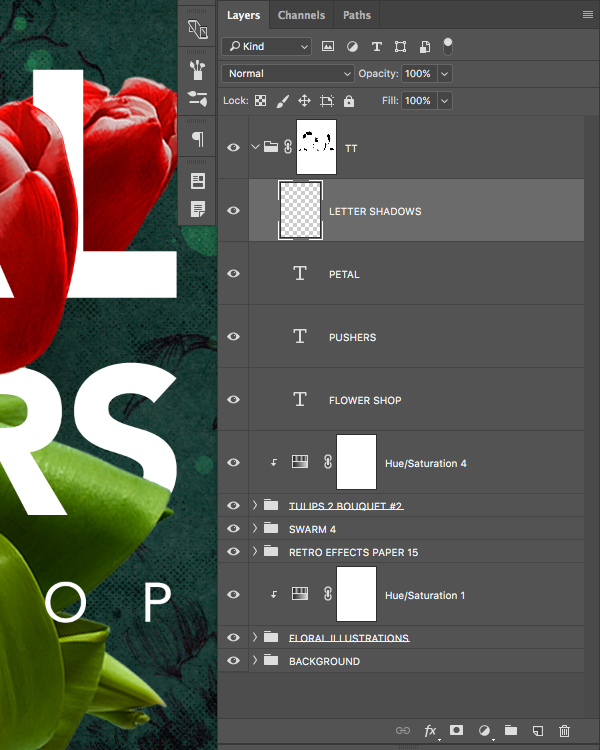 The freebie pack is just a small sampling of the resources available in The Creative’s Complete Artistic Collection for just $29 (that’s 99% off). 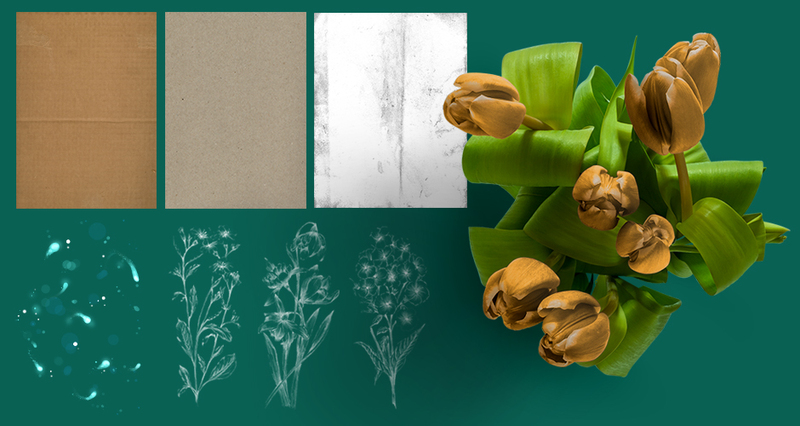 This bundle includes some of your most requested artistic packs all in one beautiful collection. 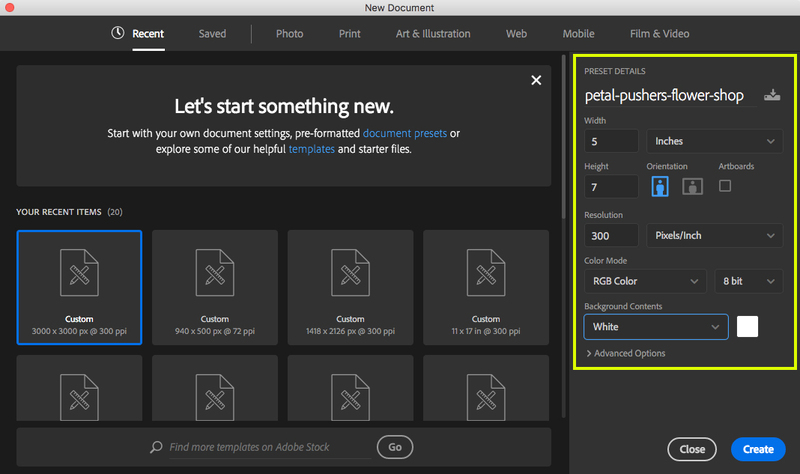 To get started let’s open up Photoshop and create a New Document. For the settings go ahead and set it up so that the document is 5”x7” with a resolution of 300 ppi, RGB Color Mode, and set the Background Contents to ‘White’. 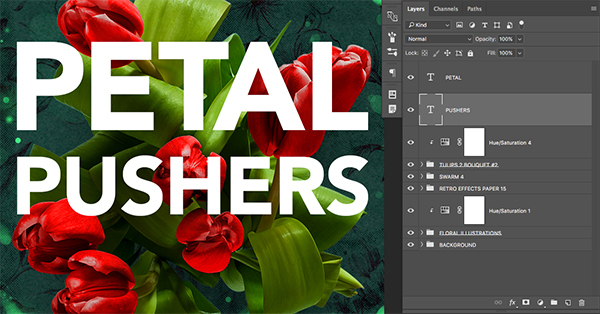 From there, go ahead and give your document a name – I will be using ‘petal-pushers-flower-shop’ and then when you are finished, click ‘Create’ in the lower right hand corner of the window. 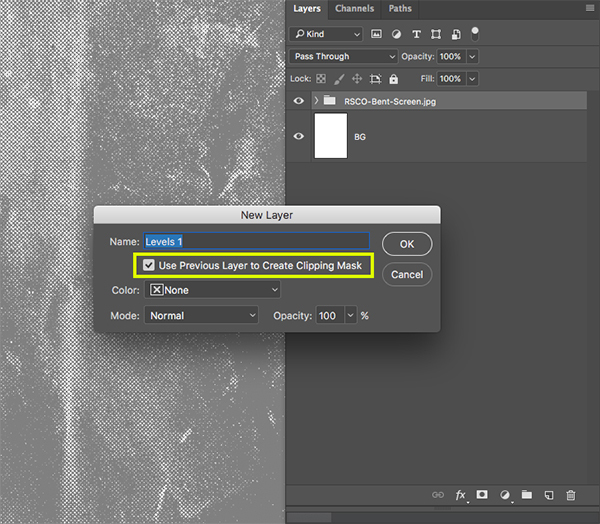 Double click on the layer and when you are prompted with the ‘New Layer’ dialog box enter a name for the layer – here I will just be calling it ‘BG’ before clicking ‘OK’ to apply the changes and unlock the layer. You should now notice that the small lock icon has disappeared and the updated name should also be displayed on the layer. 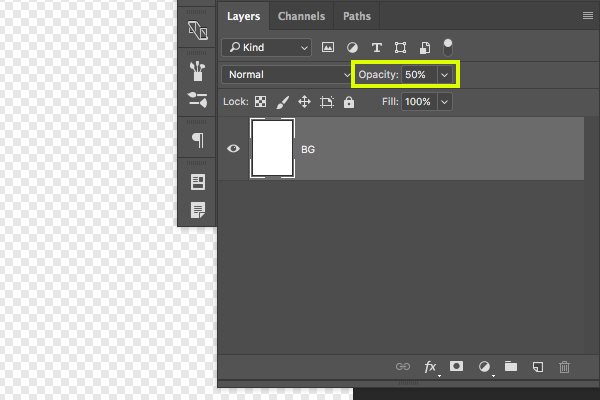 From here, move the ‘Opacity’ slide over to the left until it’s set to ’50%’ or you could simply press the number ‘5’ on the keyboard. 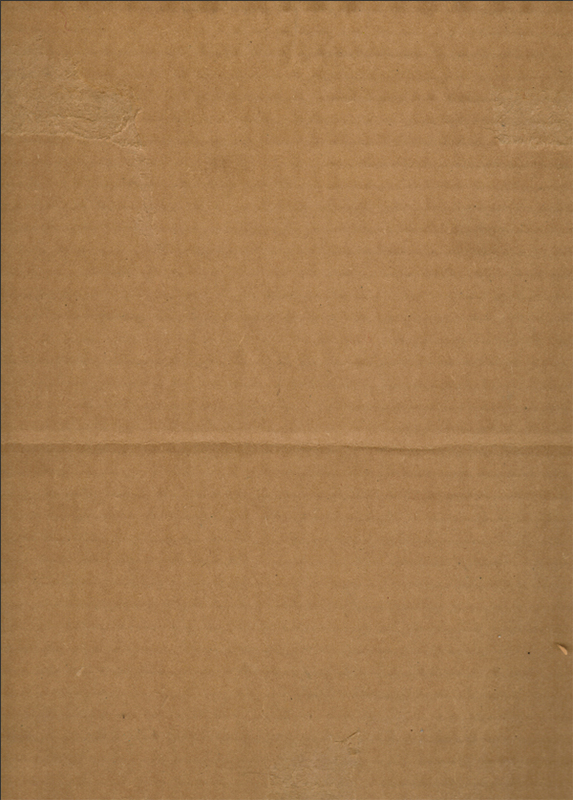 Next, open the ‘RSCO-Bent-Screen.jpg’ file from the freebies folder for this tutorial. 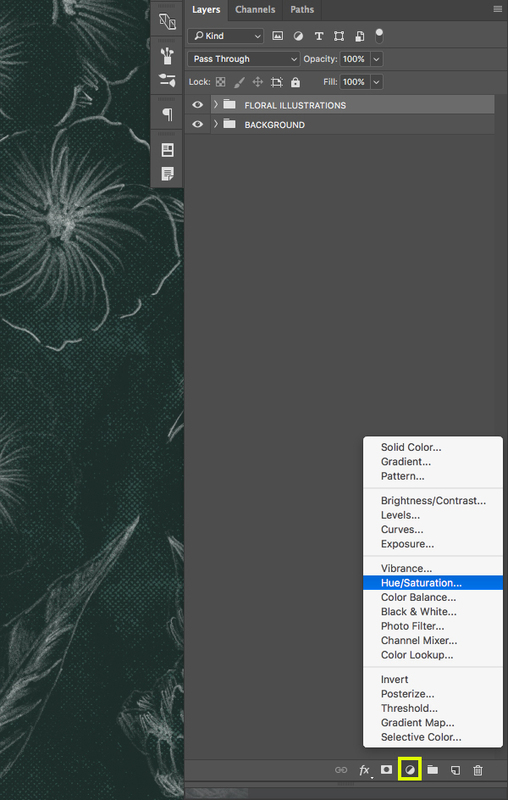 Hold the Control Key and click on the layer to reveal a dropdown menu. From here, we are going to select ‘Convert to Smart Object’ from the list. You can now give your new Group Folder a name – here I am once again just using the file name for the entire group. Once you have done that you should be prompted with another dialog box. 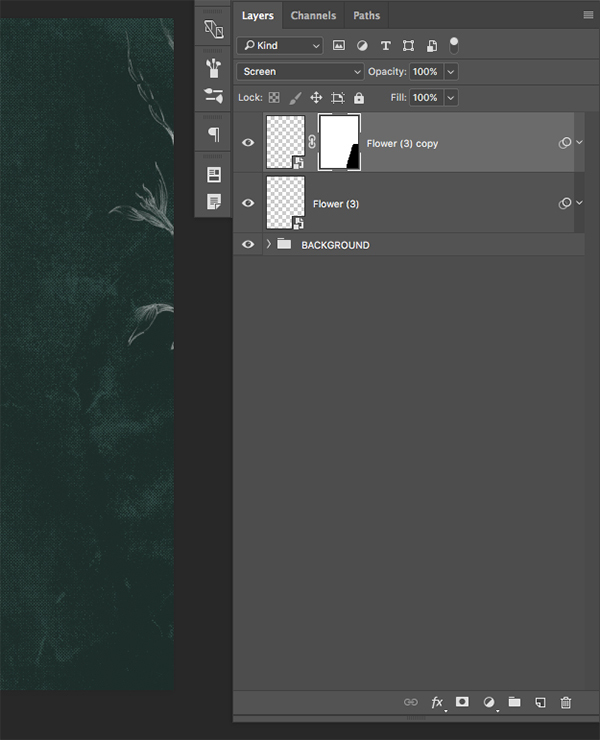 From this box we want to make sure to check off the option that says ‘Use Previous Layer to Create Clipping Mask’ and then hit ‘OK’ to apply the change. 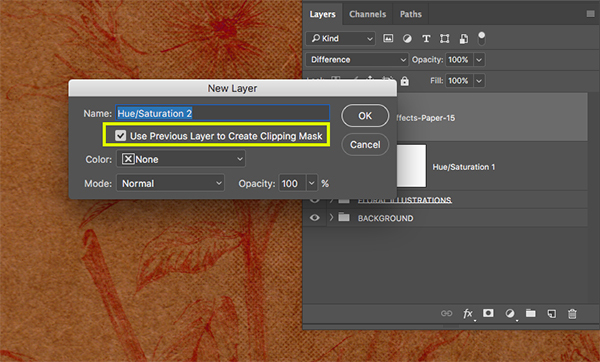 This will ensure that the Levels Adjustment will only affect the contents of the folder that the Clipping Mask is attached to. 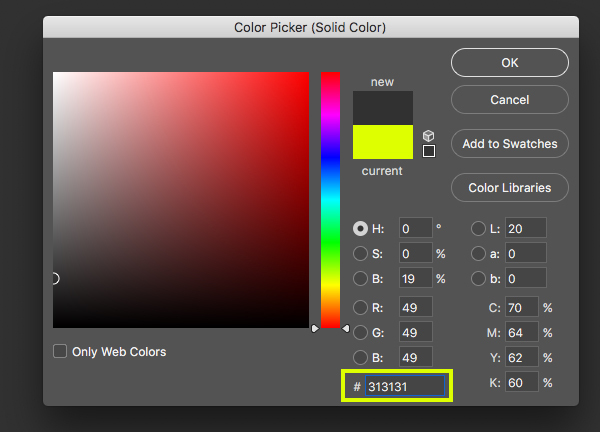 You will then be asked to choose the color you would like to use so let’s enter a hexadecimal value of ‘#313131’ which is a dark grey color. Once you have selected this color press ‘OK’ to apply the changes. 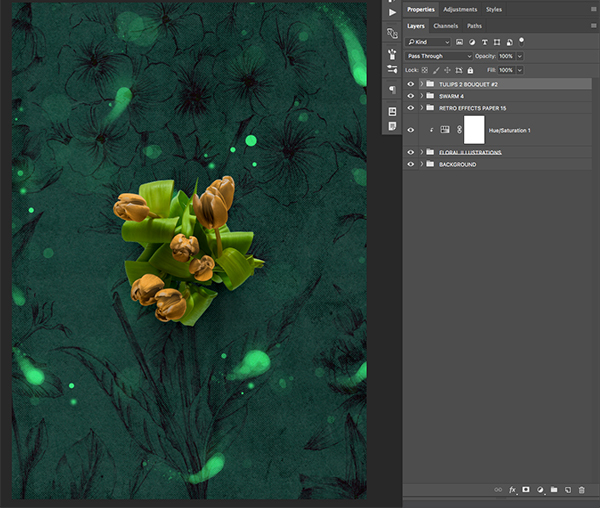 This time we don’t need to apply a Clipping Mask but what we want to do instead is change the Blend Mode of this layer to ‘Multiply’ so that our texture shows through. 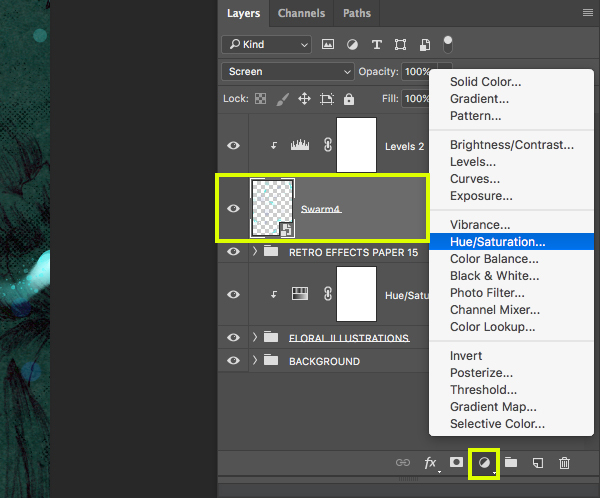 Next we will once again return to the Adjustment Layer icon at the bottom of the Layers Palette and add another ‘Solid Color…’ Adjustment Layer. 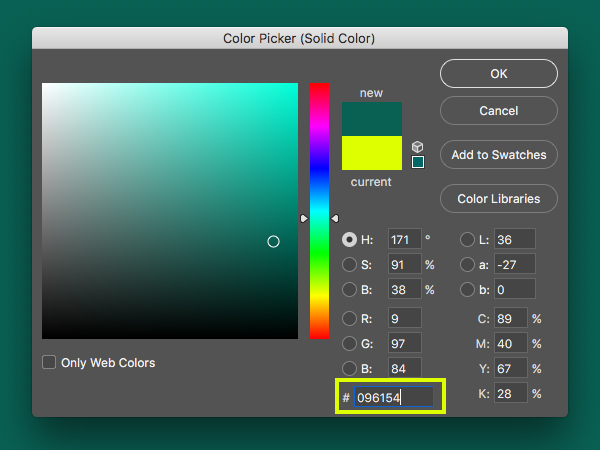 This time for the fill color let’s enter a value of ‘#096154’ and then press ‘OK’ to apply the changes. 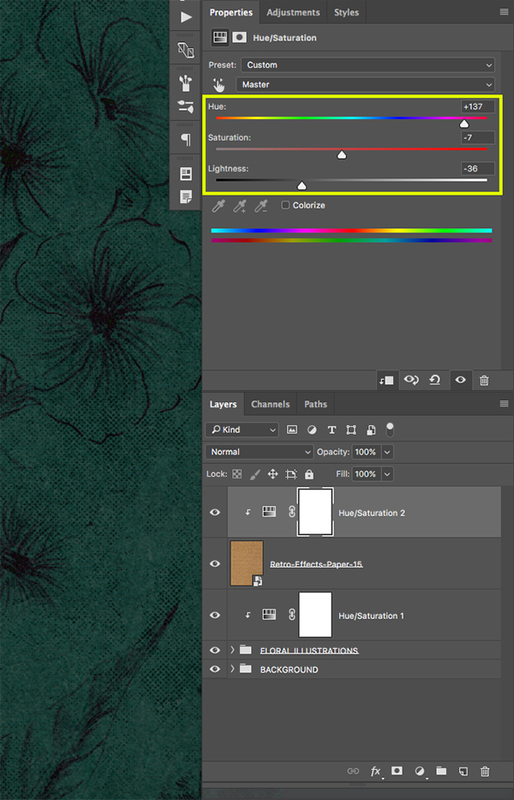 After changing the Blend Mode, select the very top layer in your Layers Palette (this should be our new Color Fill Adjustment Layer) and then hold the Shift Key and select the ‘BG’ layer at the very bottom. 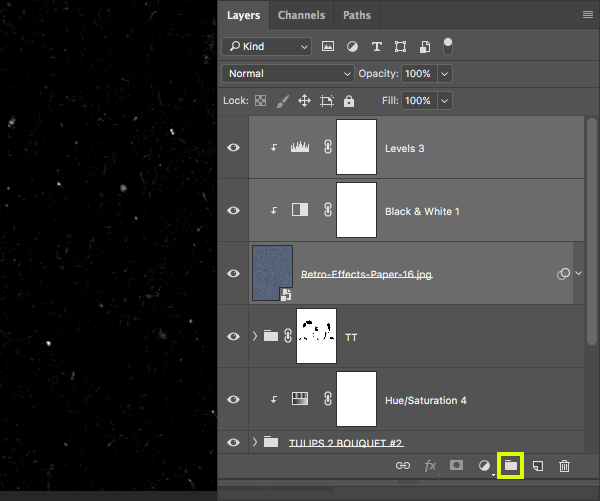 You should now have all of your layers that have been created thus far selected and highlighted at the same time. 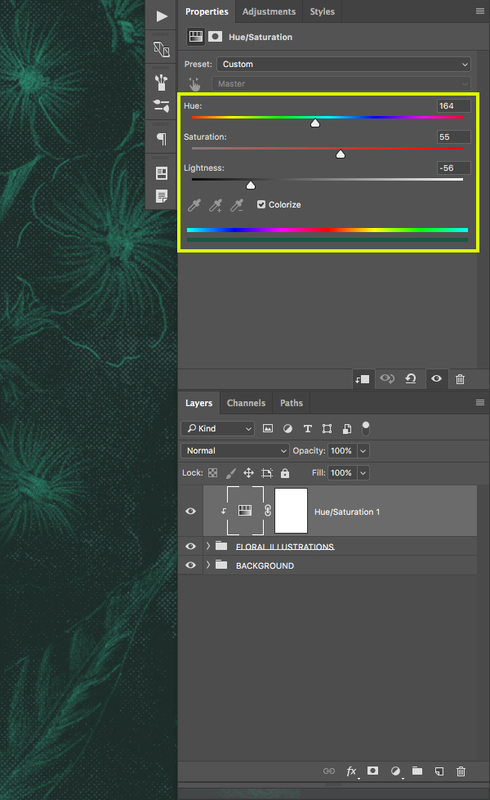 Once you have all of your layers selected, click on the small folder icon at the bottom of the Layers Palette to place all of these layers into a new Group Folder. 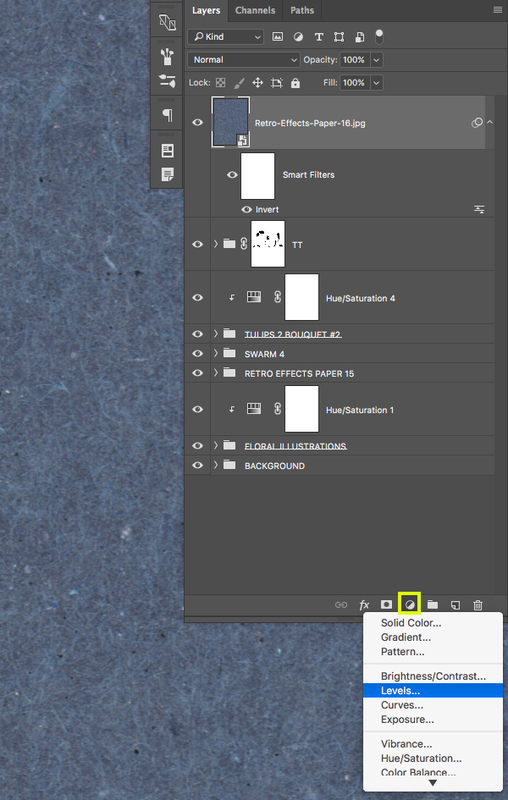 Double click the folder name and change it to ‘BACKGROUND’ so all you are left with is a single Group Folder in the Layers Palette. 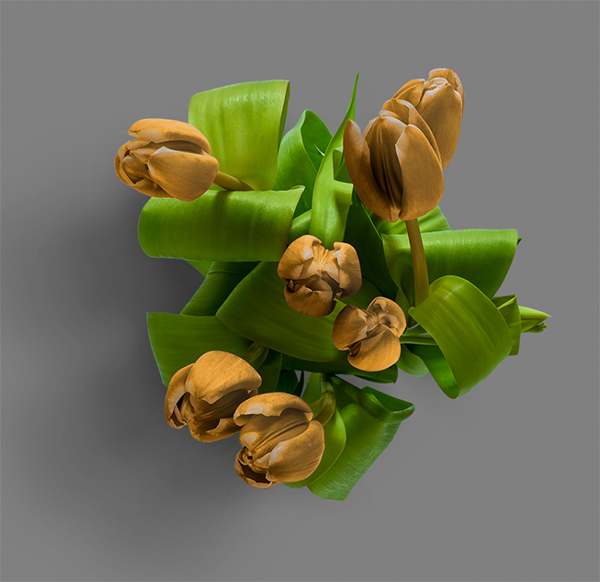 Open the ‘Flower (3).png’ file from the freebies folder in Photoshop. 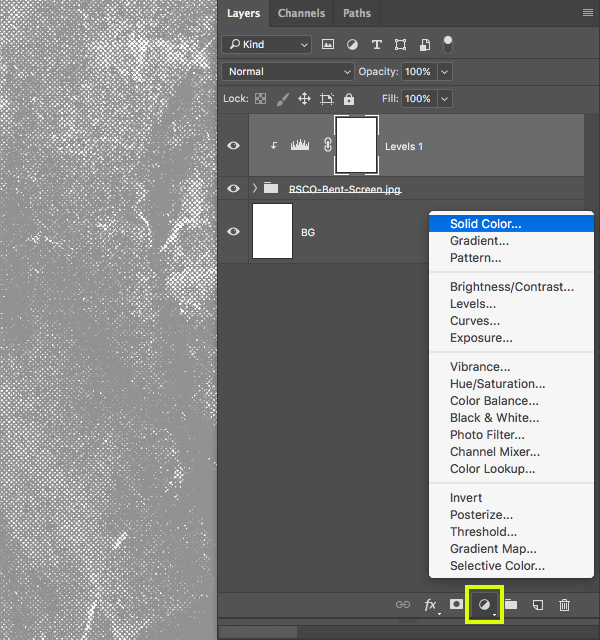 Hold the Control Key and click on the layer to reveal a dropdown menu. 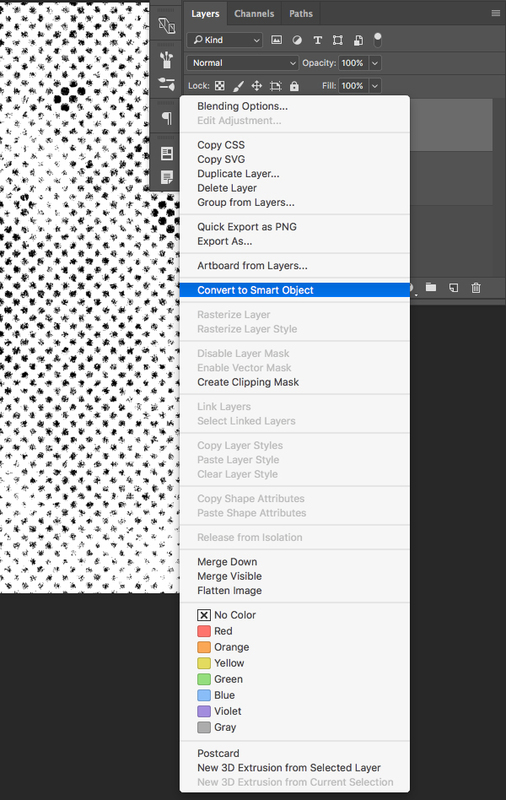 From here, choose ‘Convert to Smart Object’ to convert the layer. 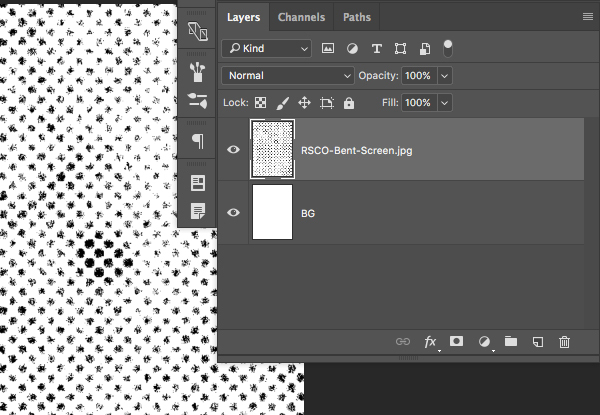 Once you have converted the illustration layer into a Smart Object, press Command/Ctrl+I on the keyboard to invert it and then change the Blend Mode to Screen. 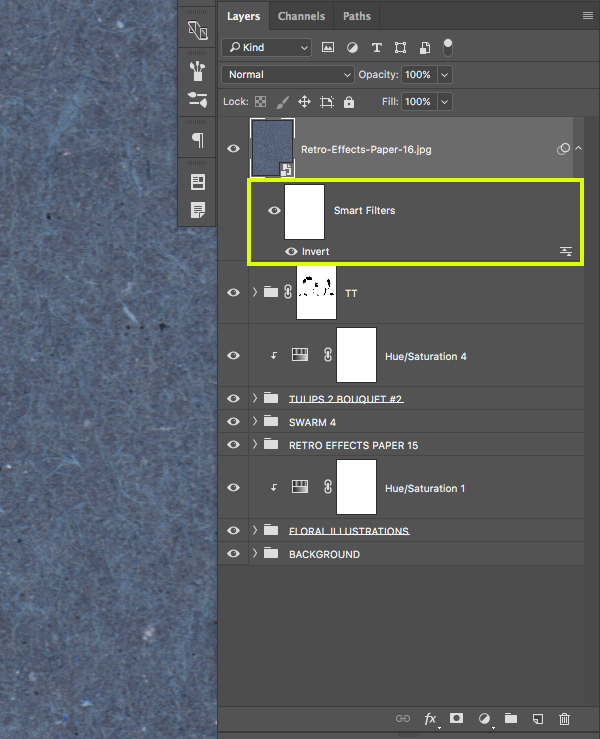 You should notice that since the layer was converted to a Smart Object prior to inverting the image, this adjustment should show up as a ‘Smart Filter’ attached to the layer. 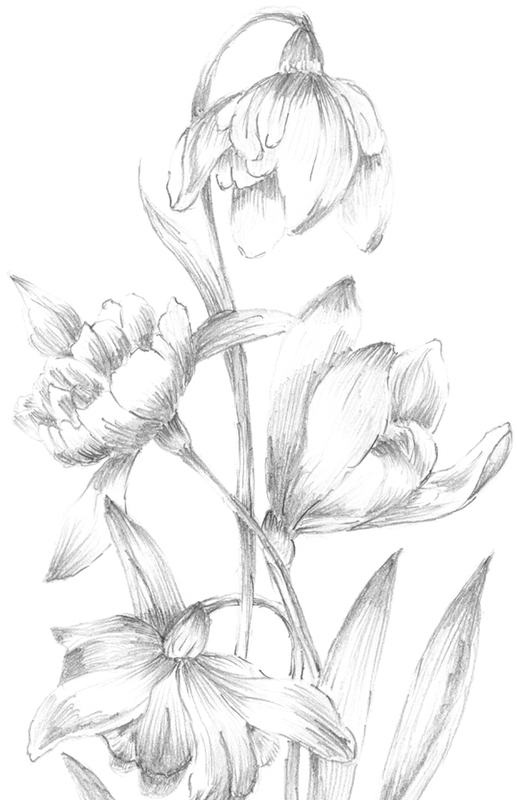 Select the ‘Flower (3).png’ layer and press Command/Ctrl+J on the keyboard to duplicate it. 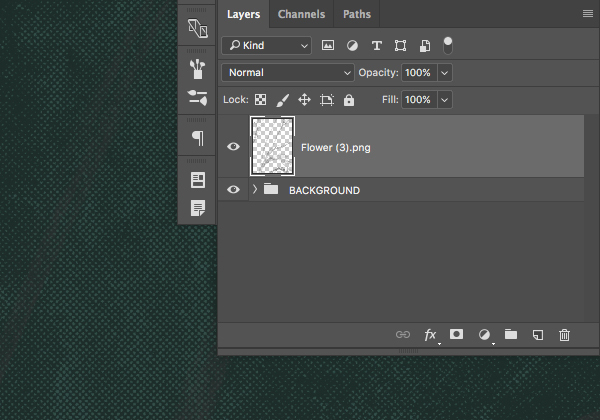 Move the copy of the layer all the way to the opposite side of the canvas so that only a few of the leaves on are showing. 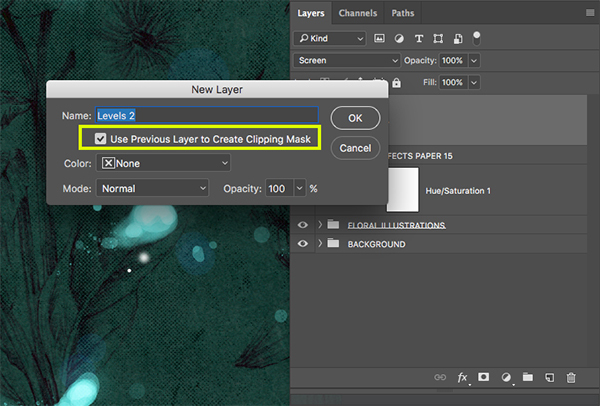 Once you’ve done that, click on the ‘Add Layer Mask’ icon at the bottom of the Layers Palette to apply a mask to the duplicate layer. 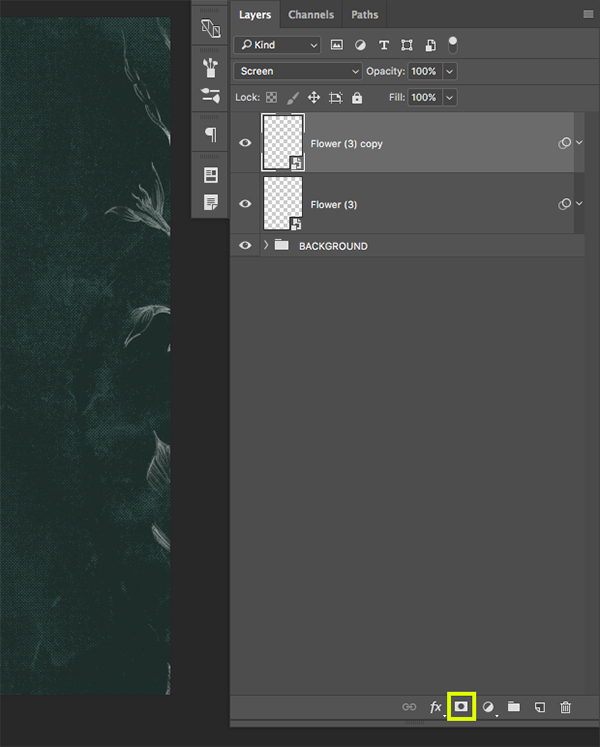 Next, open the ‘Flower (9).png’ file from the freebies folder in Photoshop. 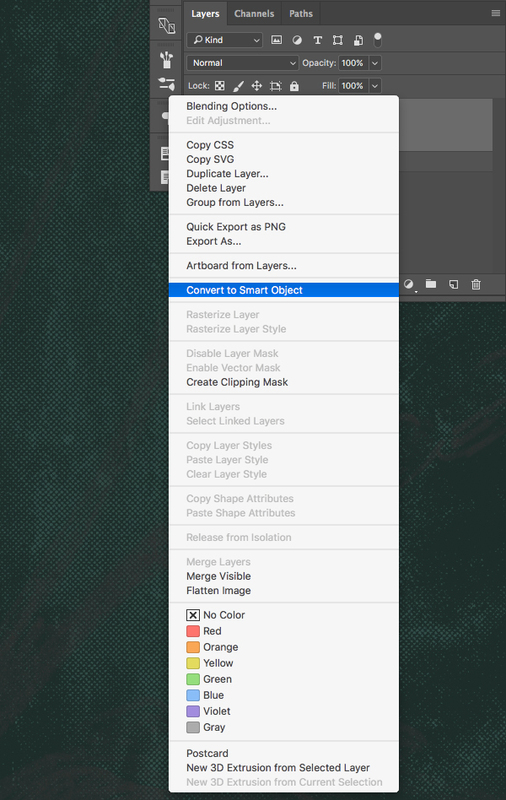 Drag the file into your main document and once again convert the layer to a Smart Object. 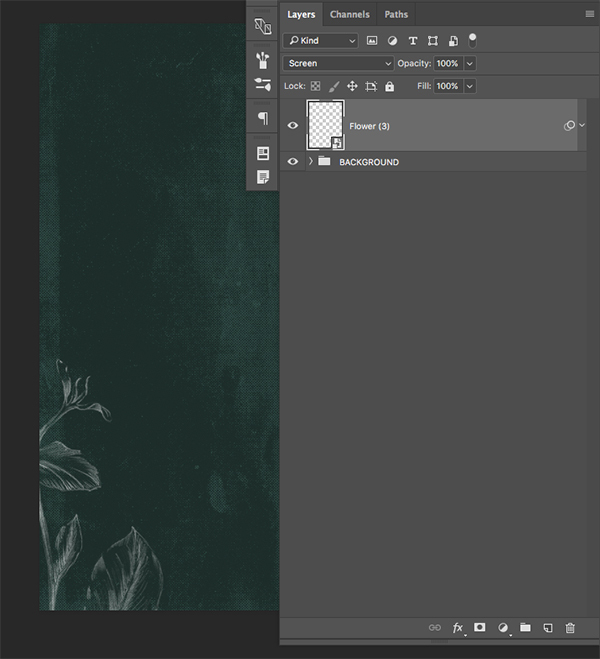 We will also want to repeat the process of inverting the layer (Command/Ctrl+I) and also changing the Blend Mode to ‘Screen’ like we did with our first floral illustration. From here we will place the layer all the way to the left and crop it in a similar way so that only a few of the leaves are coming in from one side. 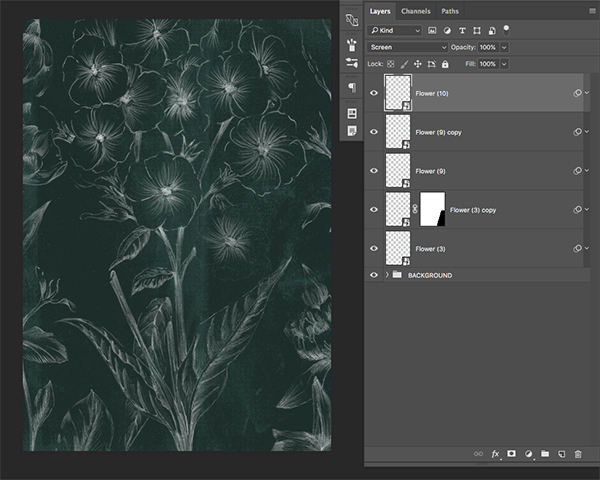 Once you are happy with the size and placement of the leaves press Command/Ctrl+J to duplicate the layer, and then move the new copy to the opposite side to create a frame of florals on both sides. 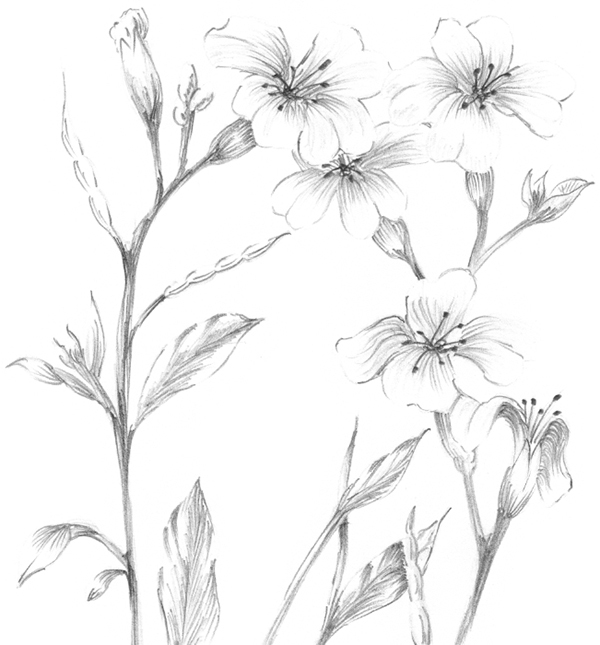 Next we will open the ‘Flower (10).png’ file from the freebies folder which will be going in the middle of our canvas. 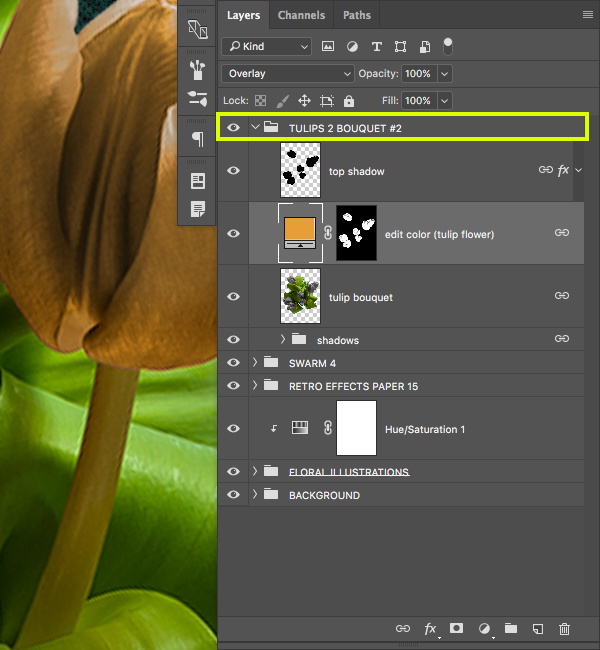 Select the very top flower illustration layer and then hold the Shift Key and select the layer just above your ‘BACKGROUND’ folder. 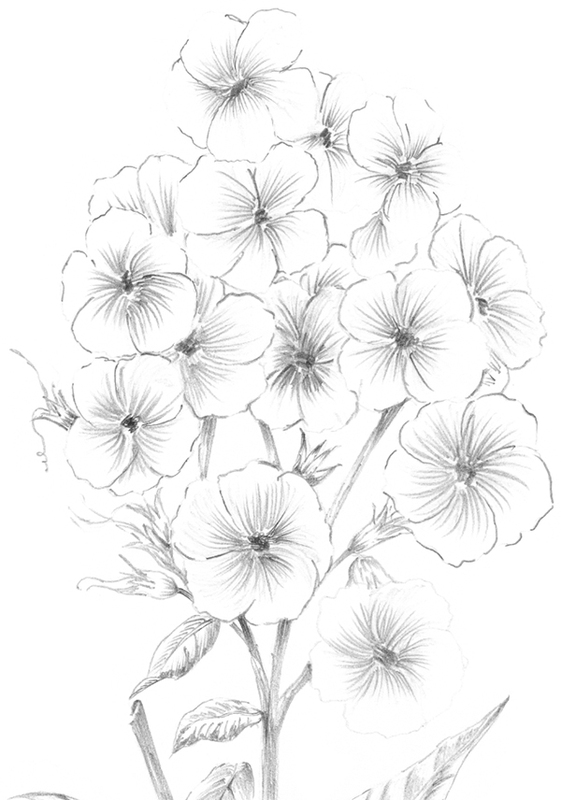 You should now have all five of the floral illustrations selected at the same time. 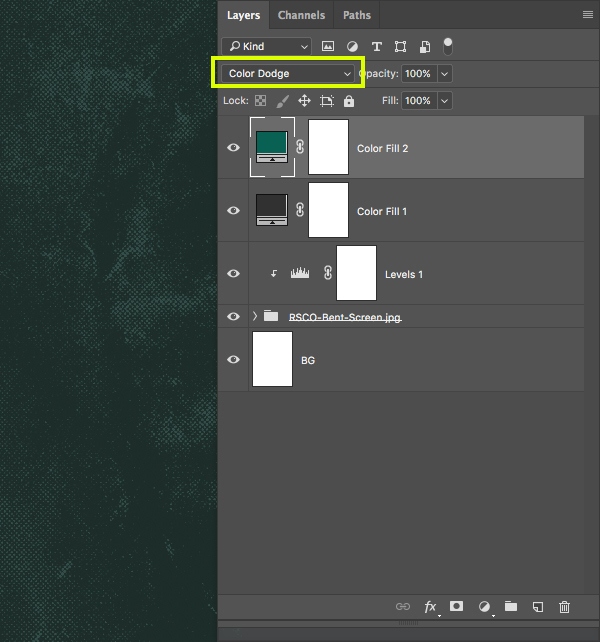 From here, select the folder icon at the bottom of the Layers Palette to place all of these layers into a single Group Folder. 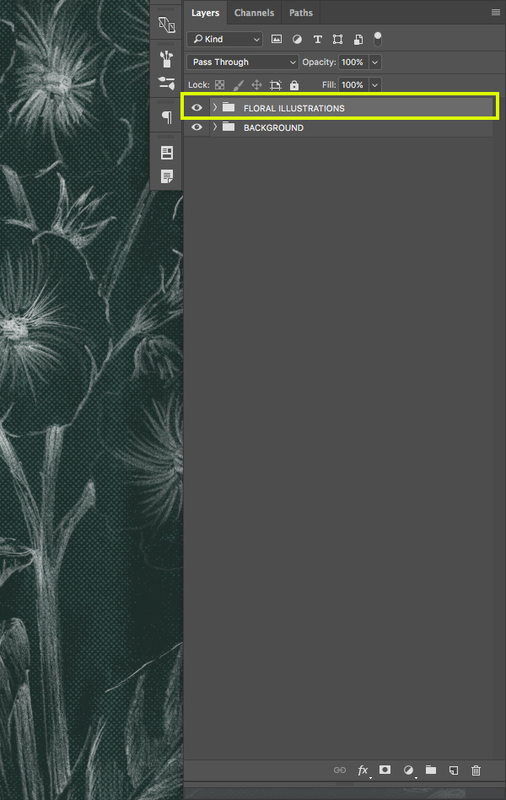 Double click on the name of the folder and rename it ‘FLORAL ILLUSTRATIONS’ or something similar of your choosing. 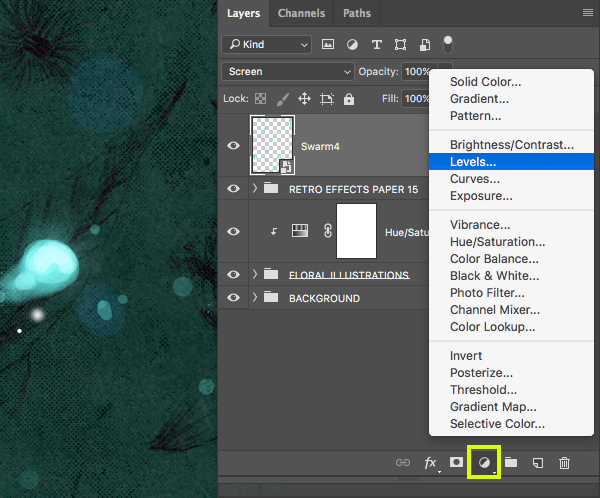 After creating the new folder, select it in your Layers Palette and then hold Alt/Option and click the Adjustment Layer icon at the bottom of the Layers Palette. 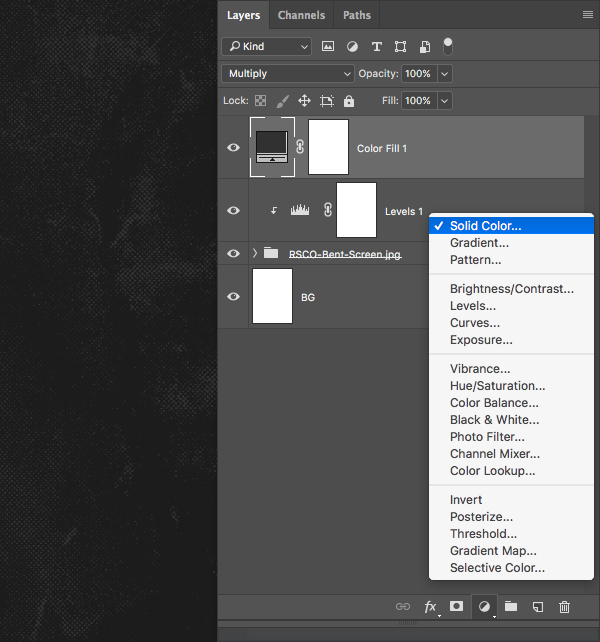 Here we are going to choose ‘Hue/Saturation…’ from the list. 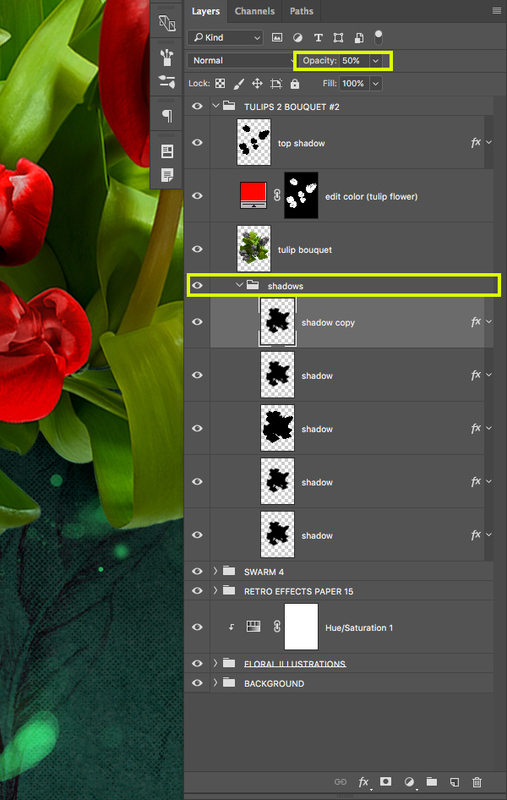 When prompted with the ‘New Layer’ dialog box, make sure to check off ‘Use Previous Layer to Create Clipping Mask’ as we want this layer to only affect the contents of our ‘FLORAL ILLUSTRATIONS’ folder. 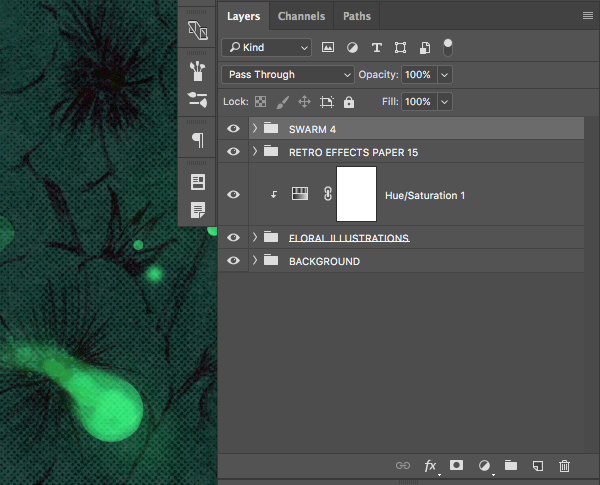 Next, hit ‘OK’ to apply the Adjustment Layer with the Clipping Mask applied to it. 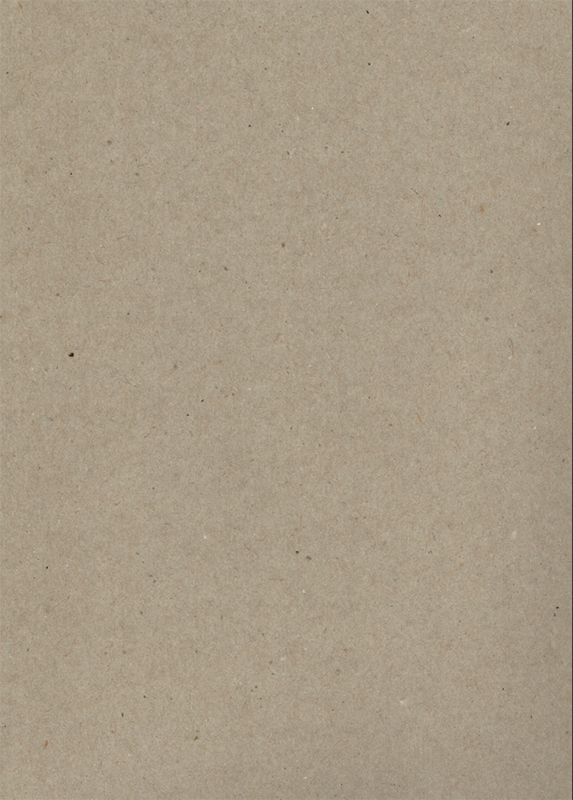 Next, open the ‘Retro-Effects-Paper-15.jpg’ file from the freebies folder. 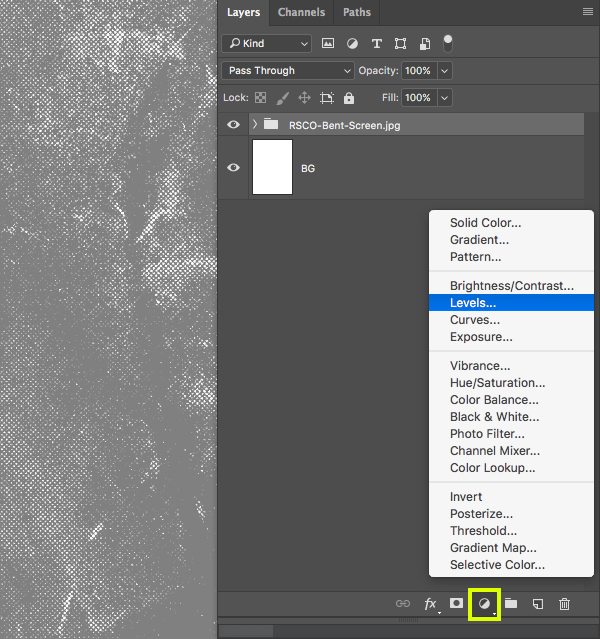 Hold the Control Key and click on the layer before choosing ‘Convert to Smart Object’ from the dropdown menu. 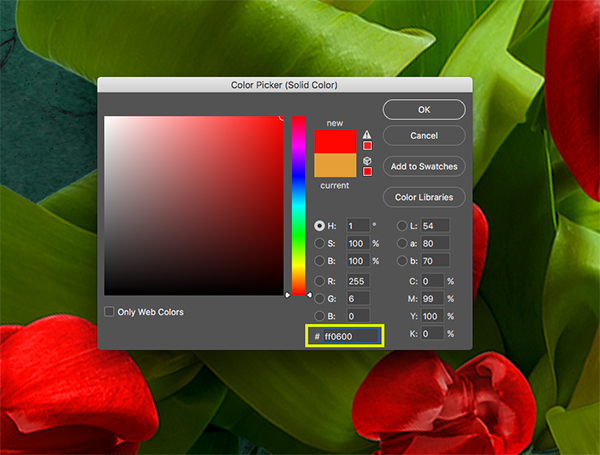 Select the paper Smart Object layer and then hold the Alt/Option key and click on the Adjustment Layer icon at the bottom of the Layers Palette before once again choosing ‘Hue/Saturation…’ from the menu. 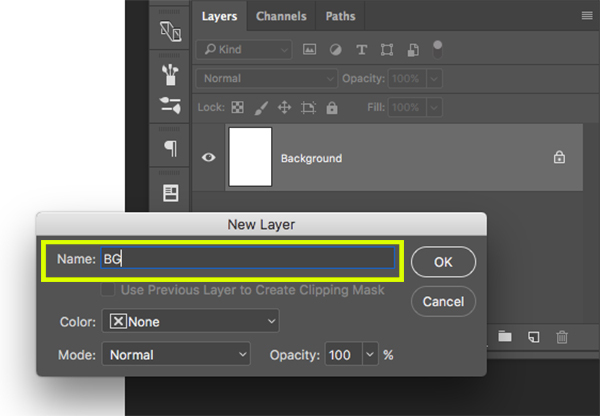 Be sure to check off the ‘Use Previous Layer to Create Clipping Mask’ check box before pressing ‘OK’ to apply the changes. 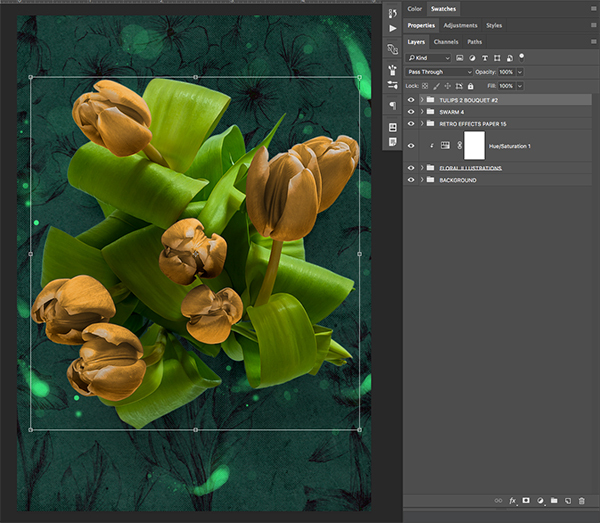 Open the ‘swarm4.png’ file from the freebies folder in Photoshop. 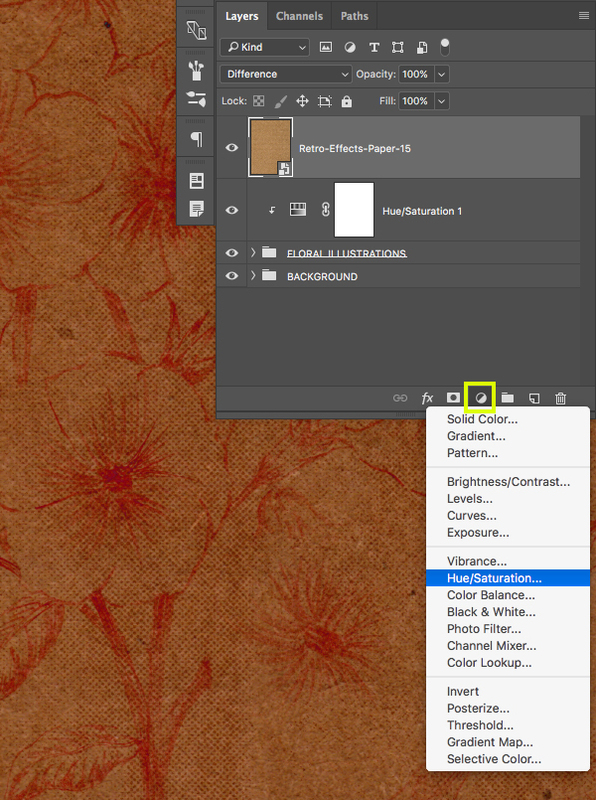 Drag the image into your document and place it at the top of your Layers Palette. 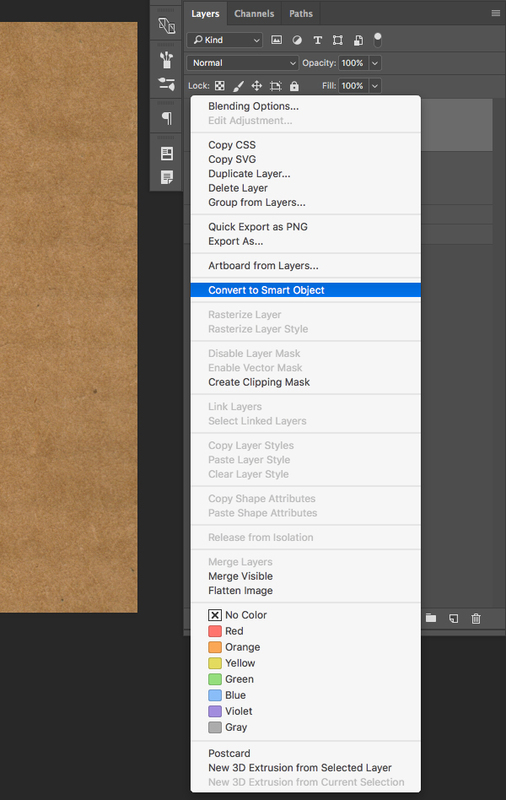 Hold the Control Key, click on the layer, and then choose ‘Convert to Smart Object’ to convert the layer. 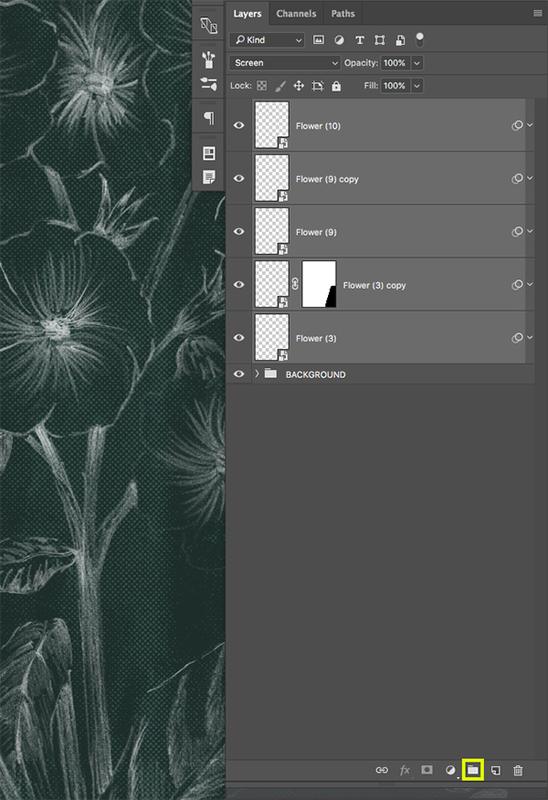 From here, double click on the layer name and replace it with ‘Swarm4’. Next, press Command/Ctrl+T to initiate a Free Transform Command and then rotate the image 90º clockwise by holding the Shift Key, moving your cursor over any of the four corners and then turning the image so that it spans vertically instead of horizontally. 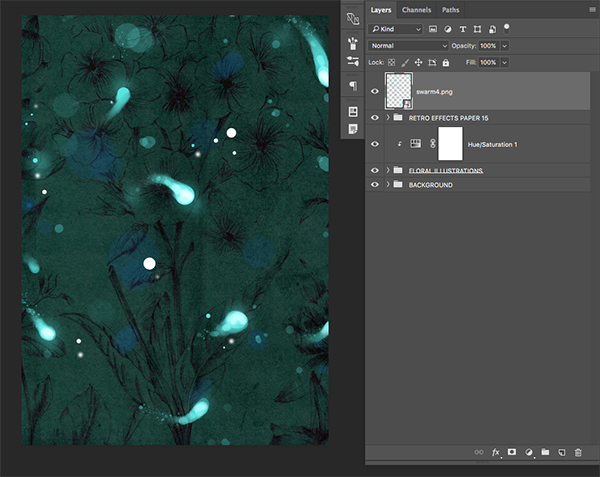 Before pressing the ‘Enter’ key to apply the changes, shrink the layer down so that you can see more of the fireflies on the canvas. 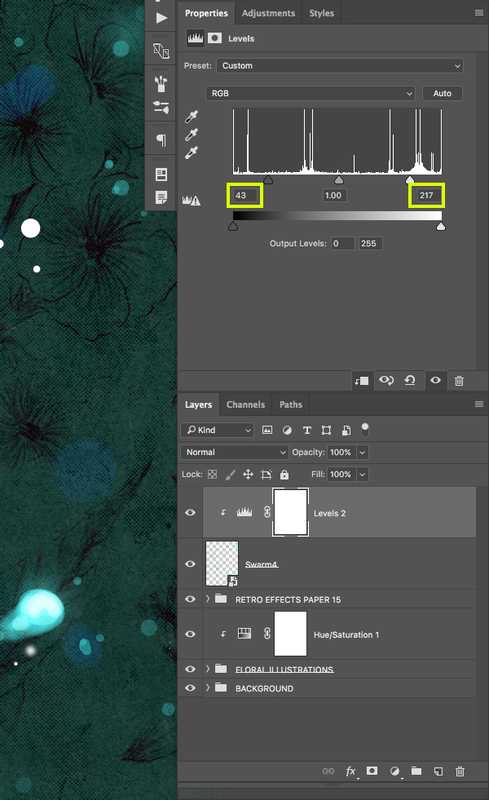 Once you are happy with the size and placement of your swarm image, hold the Alt/Option key and click on the Adjustment Layer icon at the bottom of the Layers Palette before choosing ‘Levels…’ from the menu. 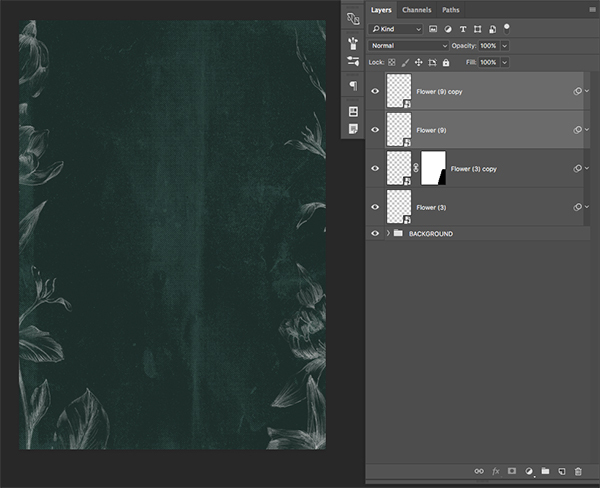 Check off the ‘Use Previous Layer to Create Clipping Mask’ option and then click ‘OK’ to apply the changes. 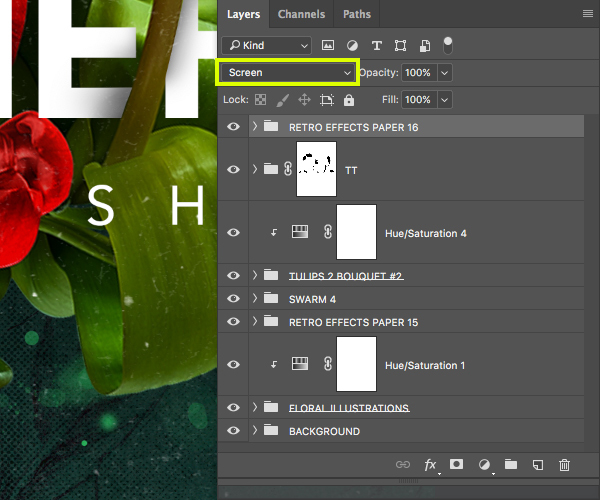 Select the ’Swarm4.png’ Smart Object in your Layers Palette and then click on the Adjustment Layer icon once again. 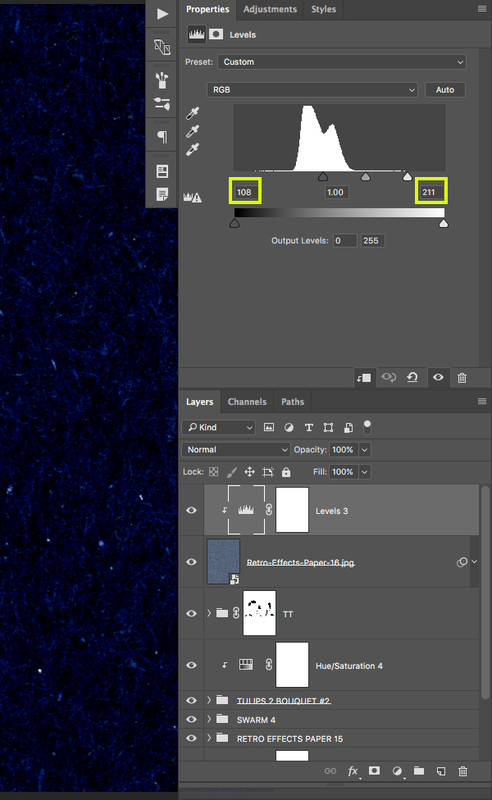 This time we want to apply a ‘Hue/Saturation…’ Adjustment Layer. 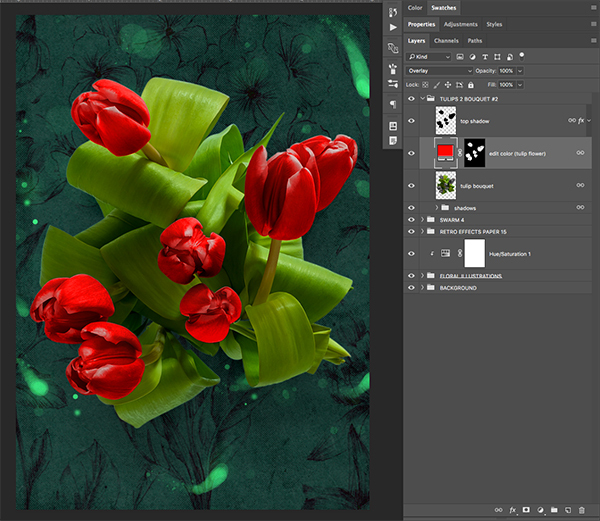 Open the ‘Tulips_2_Bouquet_#2.psb’ file from the freebies folder for this tutorial in Photoshop. 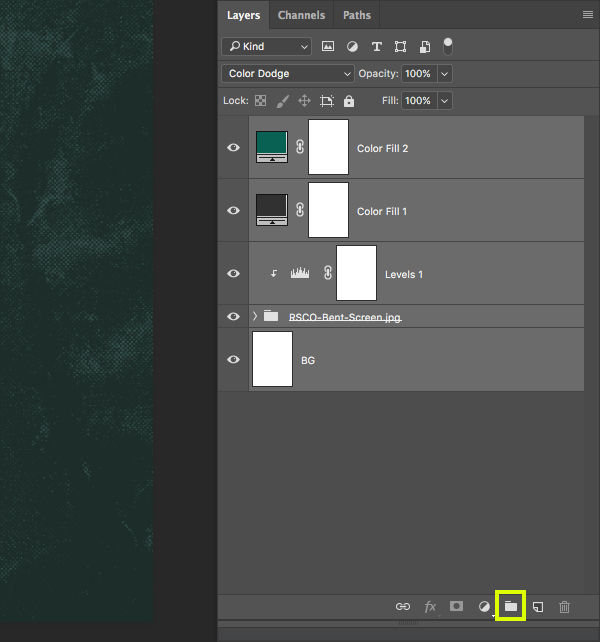 Click and drag the folder into your working document and place it roughly in the middle of the canvas but at the top of the Layers Palette. 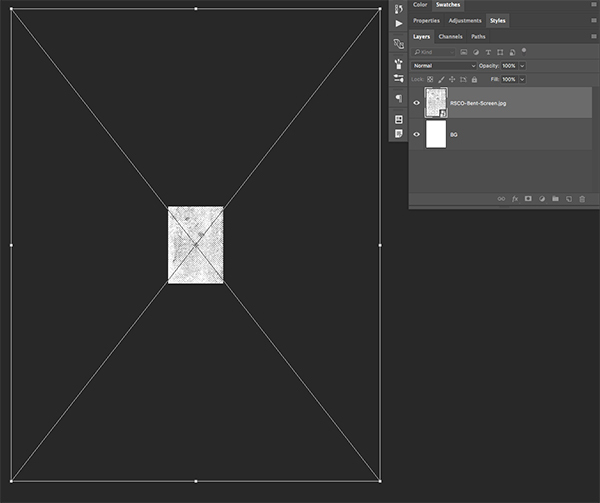 Press Command/Ctrl+T to initiate a Free Transform and then hold the Alt/Option+Shift keys and drag outwards from any of the four corners of the bounding box to scale the image up proportionally from the center. From here we will also rotate the image clockwise a bit before pressing ‘OK’ to apply the changes. Use the image below as a guide for the size and positioning of your bouquet. 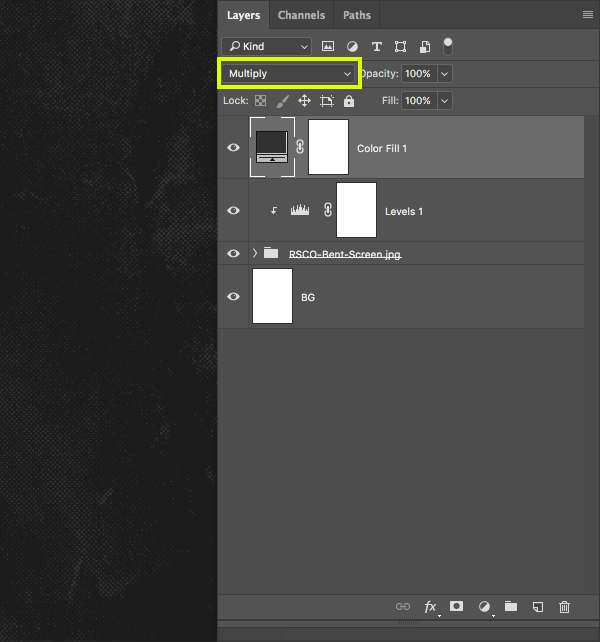 Click on the small arrow next to the folder name to expand the contents of the group. 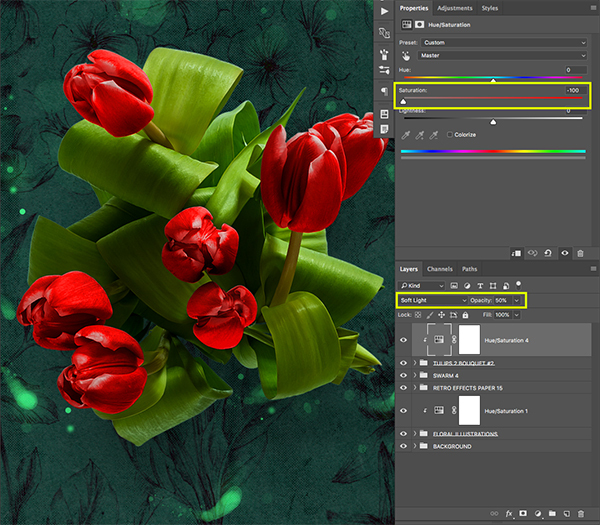 Notice inside that there is a Color Fill Adjustment Layer that controls the color of the bulbs of the tulips. 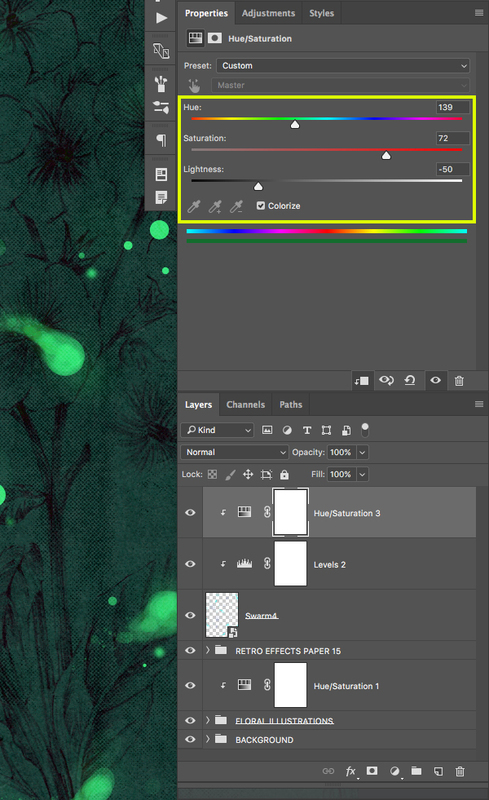 Double click on the small color swatch thumbnail to bring you to a window where you can change this color. Once the dialog box appears, let’s change the hex value to ‘#FF0600’ and then press ‘OK’ to apply the changes. 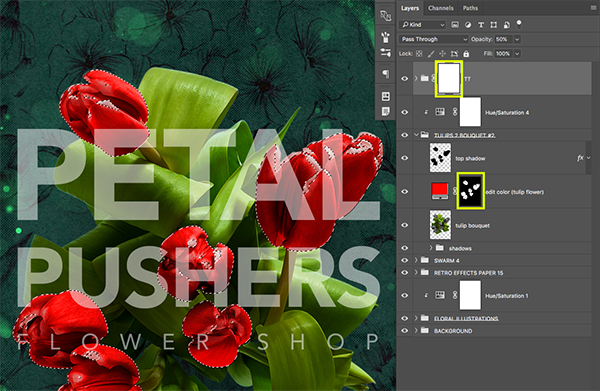 Open the ‘TULIPS 2 BOUQUET #2’ Group Folder and then hold the Alt/Option key and click on the Adjustment Layer icon at the bottom of the Layers Palette. 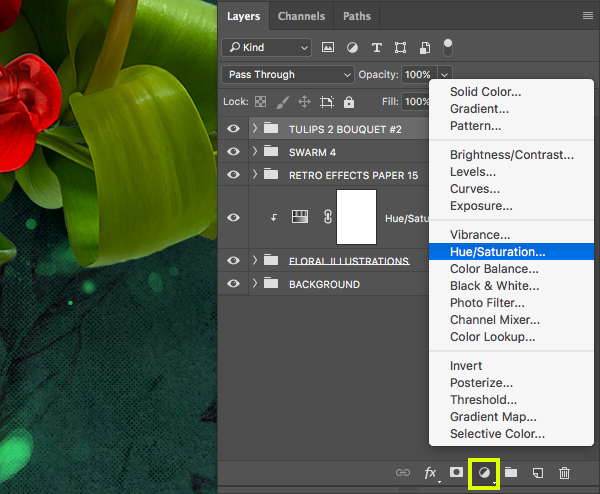 From the menu that pops up, choose ‘Hue/Saturation…’ from the list. 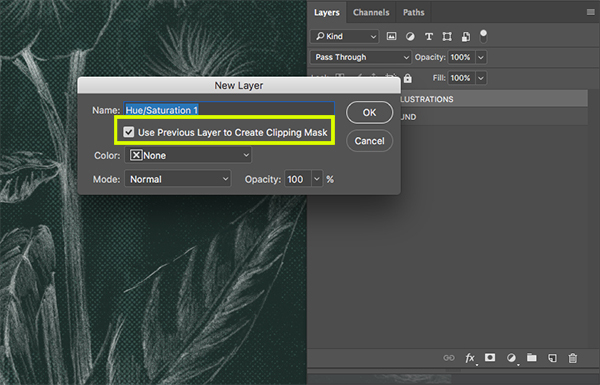 When prompted with the ‘New Layer’ dialog box, check off the option that says ‘Use Previous Layer to Create Clipping Mask’ and then hit ‘OK’ to apply the change. 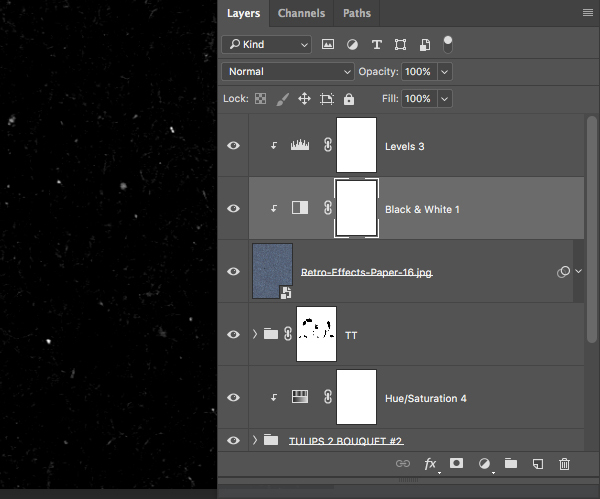 All we want to do here is move the ‘Saturation’ slider all the way to the left so that it’s set to ‘-100’ and then change the Blend Mode of the layer to ‘Soft Light’ and press the number ‘5’ on the keyboard to reduce the opacity of the layer to ’50%’ in order to create some more contrast in the bouquet. 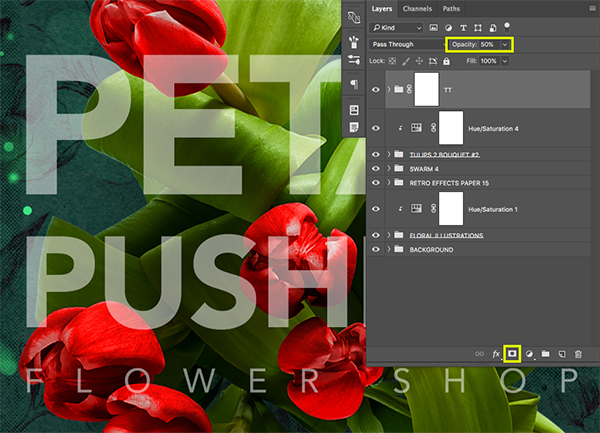 Create a new layer at the top of your Layers Palette and press ’T’ to switch over to your Type Tool. 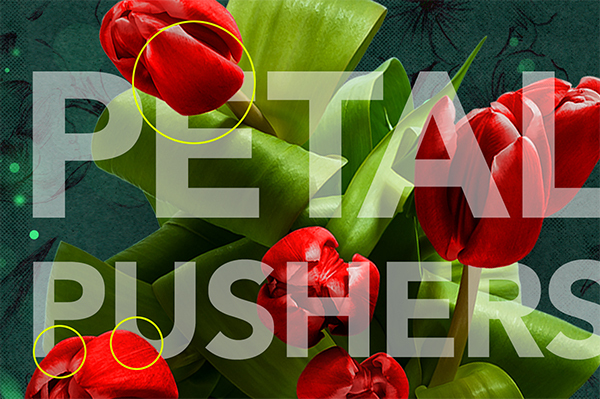 Click on the canvas and type out the word ‘PETAL’ in all caps. For the typeface I am using ‘Avenir’ in the ‘Black’ style and increase the size of the type so it spans across the bouquet (about 115 pt). If you want to see the Character Panel to check your settings you can access it by going to the Window Menu and choosing ‘Character’ from the dropdown menu. 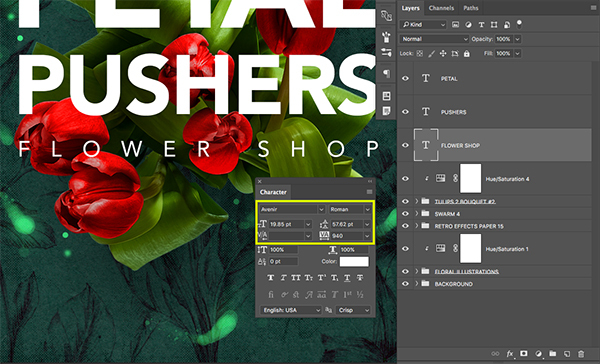 Create a copy of your second line of text by selecting the ‘PUSHERS’ layer and pressing Command/Ctrl+J once again. Hold the Shift Key and drag this layer down below the second line of text. For this line we will type out the words ‘FLOWER SHOP’ still using ‘Avenir’ but let’s change the style from ‘Black’ to ‘Roman’. We will also reduce the size to about ’19.85 pt’ and increase the tracking to ‘940’ so we can space the letters out and have this smaller line match the width of the two lines above. 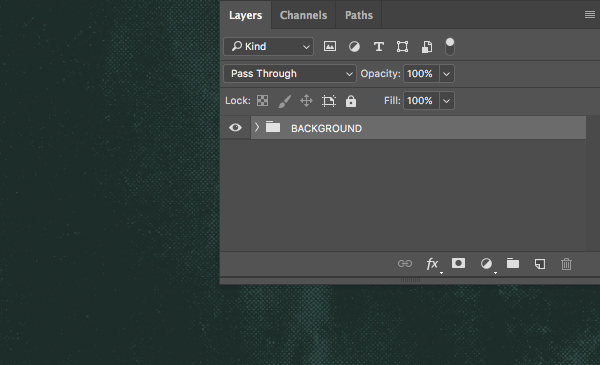 Press ‘B’ on the keyboard to switch to your Brush Tool and make sure that you have a small, hard, round brush selected and that your foreground color is set to solid black. 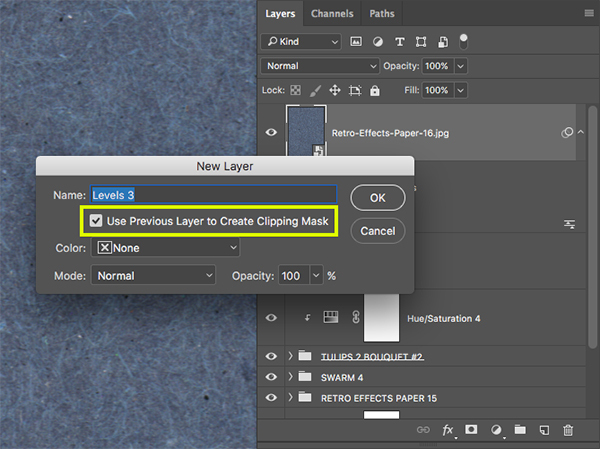 The next thing we want to do is make sure that the Layer Mask attached to our ‘TT’ folder is selected. 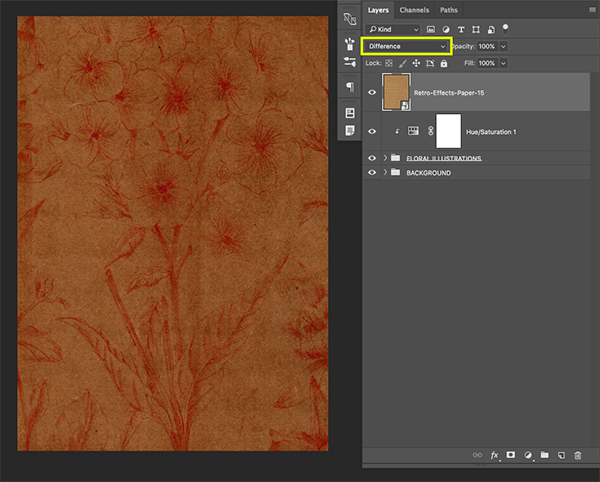 After that, hold the Command/Ctrl Key and click on the layer mask thumbnail of the red Color Fill Adjustment Layer. This will create a selection using the existing mask around all of the red bulbs of the flowers which is going to help us paint out the letters where we want them to appear to go behind the flowers. You should now see the marching ants indicating your active selection around the red bulbs of the tulips. 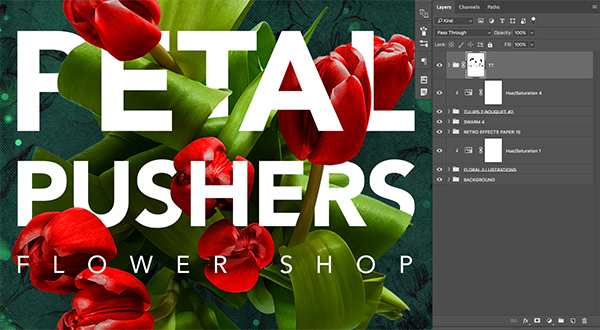 Use the hard round brush to begin painting over the letters where you want them to be covered by the red bulbs of the flowers. Here I have highlighted a few sections that I want to appear to come in front of the letters. 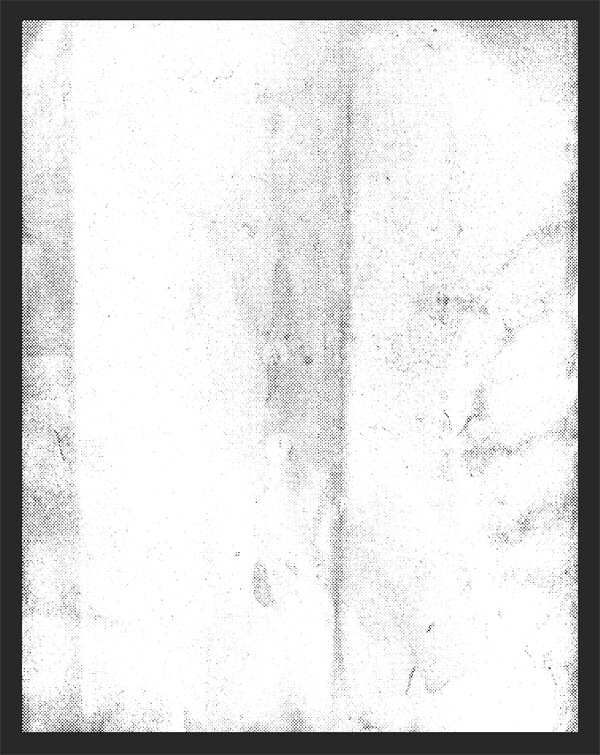 This is why it is so important to be able to see through the text by reducing the opacity of the folder. 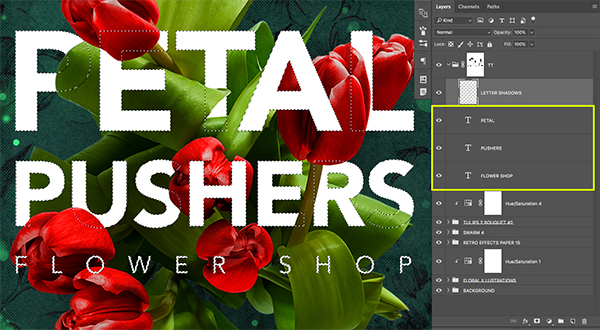 The trick is to place your text in front of interesting shapes created by the bouquet. 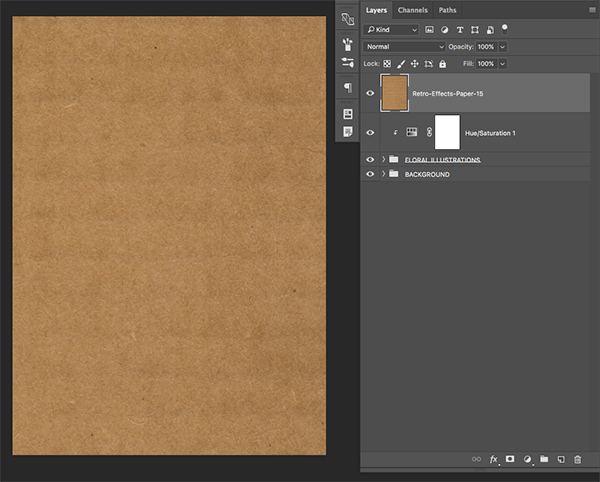 Inside of the ‘TT’ folder, make sure that you have your ‘LETTER SHADOWS’ layer selected in the Layers Palette. 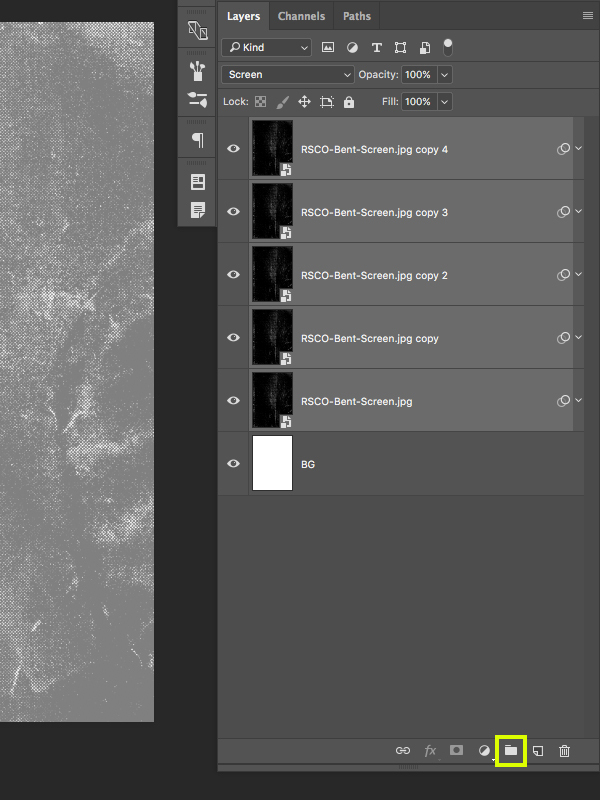 Next, hold the Command/Ctrl+Shift keys and click on the layer thumbnail of each of the three text layers in the folder. 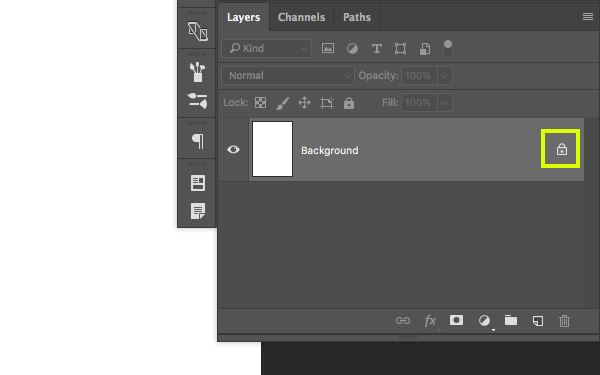 Normally we would just hold the Command/Ctrl Key and click on the layer thumbnail to make a selection on a single layer, but by also holding Shift we can add to our existing selection. The goal here is to end up with a selection around all three text layers while your new layer is still selected and highlighted in the Layers Palette. 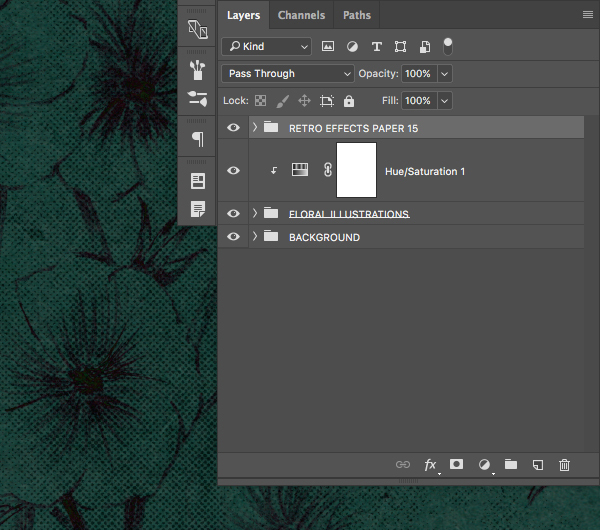 Open the ‘Retro-Effects-Paper-16.jpg’ file from the freebies folder in Photoshop. 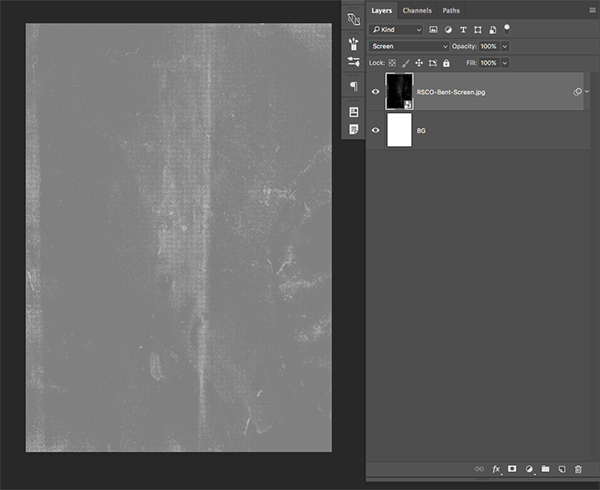 Select your new Smart Object layer and press Command/Ctrl+I to invert the image. 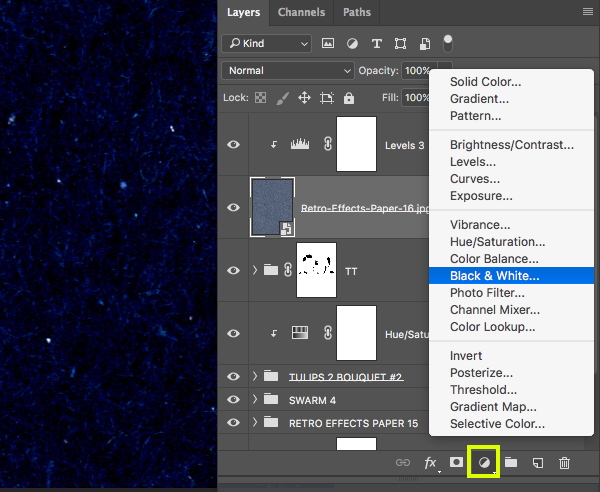 Select the ‘Retro-Effects-Paper-16.jpg’ layer and then hold the Alt/Option Key and click on the Adjustment Layer icon at the bottom of the Layers Palette. From here we want to select ‘Levels…’ from the menu that appears. 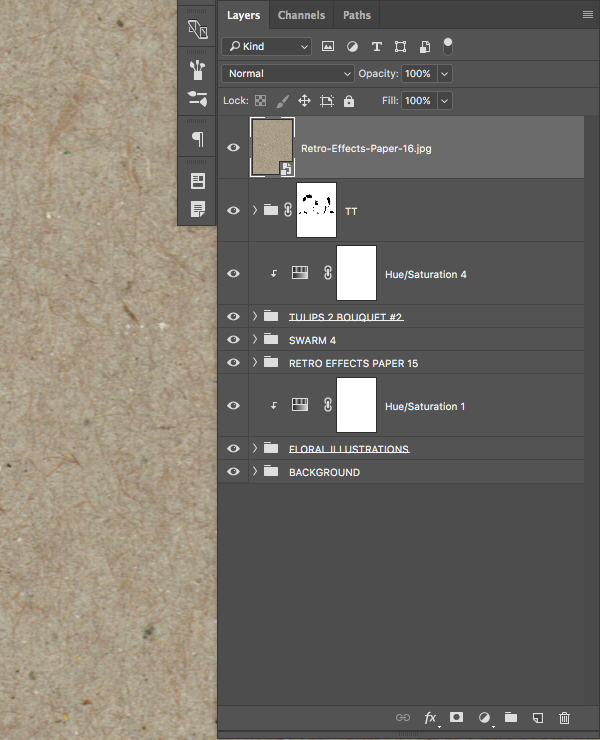 Next we will check off the ‘Use Previous Layer to Create Clipping Mask’ option and then click ‘OK’ to apply the changes. 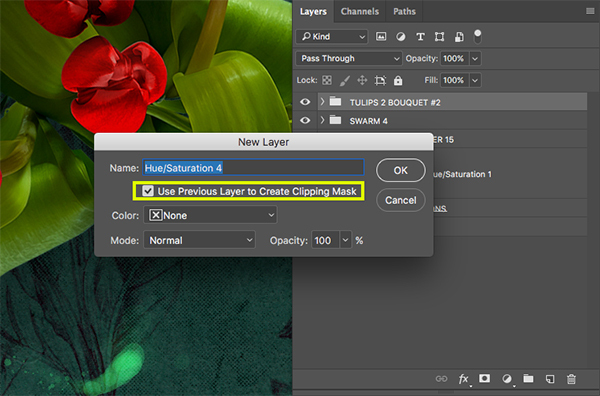 You should now have a new Levels Adjustment Layer with a Clipping Mask applied to it so that it will only be affecting the texture layer below. For the settings, enter a value of ‘108’ on the left slider, and a value of ‘211’ for the slider to the right. 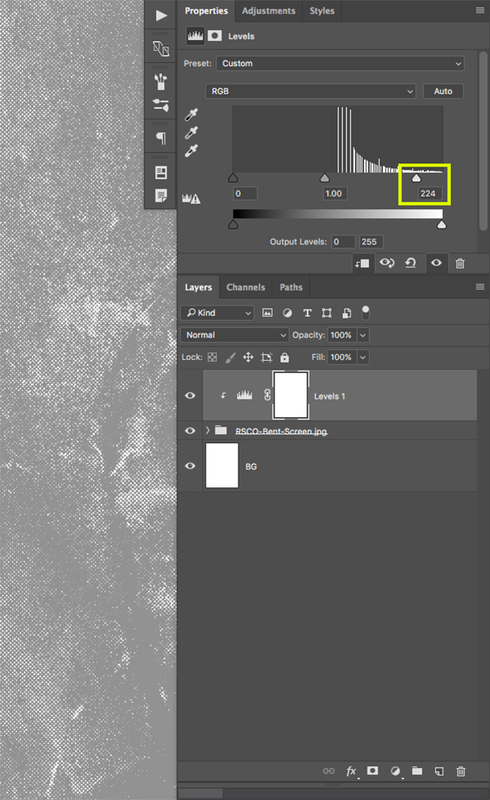 Select the ‘Retro-Effects-Paper-16.jpg’ layer again and return to the Adjustment Layer icon at the bottom. This time we will choose ‘Black & White…’ from the list. 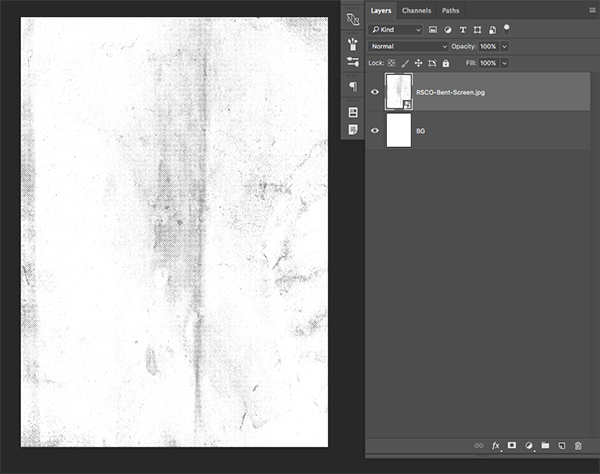 The Black & White Adjustment Layer should already have a Clipping Mask applied to it once it’s added in between the paper texture and the Levels Adjustment we created in the previous step. 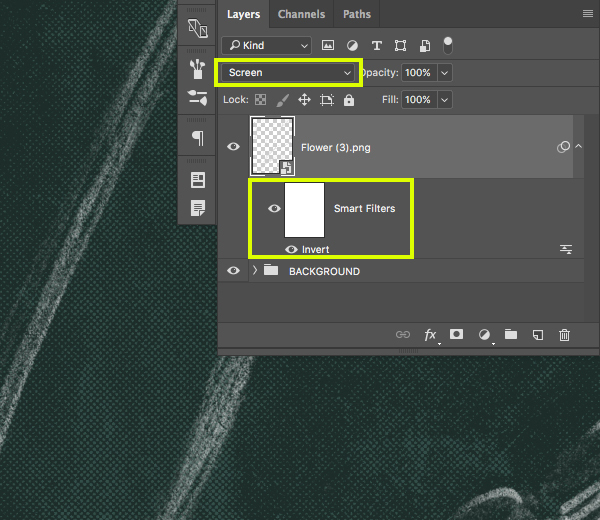 Select the top Adjustment Layer, and then hold the Shift Key and click on the paper texture Smart Object layer so all three of the layers are selected together. 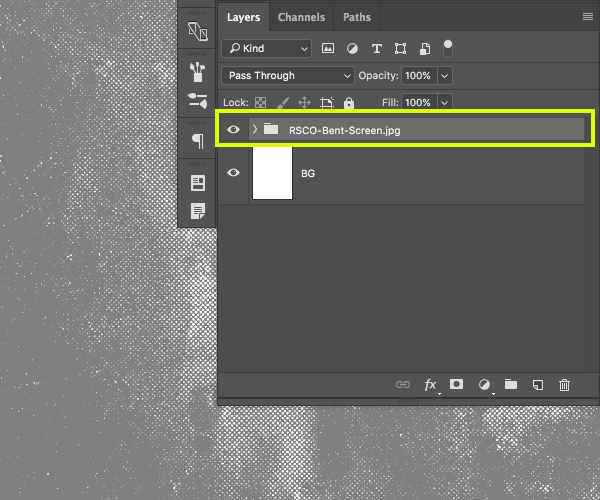 From there you can either press Command/Ctrl+G or click on the folder icon at the bottom of the Layers Palette to place these three layers into a new Group Folder. 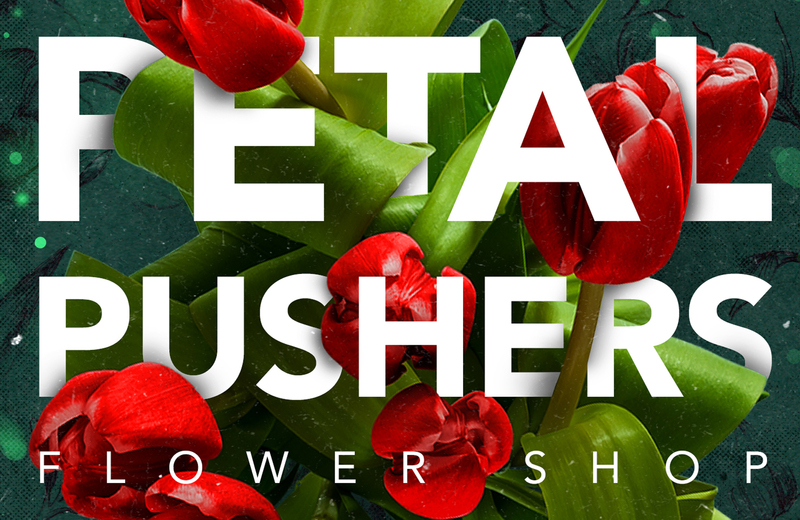 We have now completed our Petal Pushers Flower Shop design! I hope that you guys had some fun following along with this tutorial and that you learned some helpful tips and tricks along the way. Remember that this is just a small sample of some of the world class assets that you will get to work with in The Creative’s Complete Artistic Collection! There’s still time to check out The Creative’s Complete Artistic Collection where you’ll discover vibrant graphics, a massive selection or brushes and styles, floral designs, patterns, unique action packs, textures, effects, templates and even a vector scene creator all for just $29! thank you so much – great fun! You are very welcome Claire :). We hope you had fun working through the tutorial and please do feel free to share your finished piece! Awesome tutorial.Thank you very much giving files to us.You are GREAT! 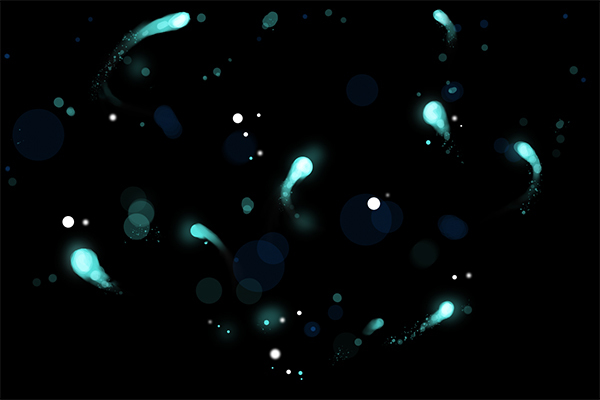 Good stuff ^_^ Thanks for the quality tutorial! Thanks Christopher! We are so happy that you enjoyed this one! 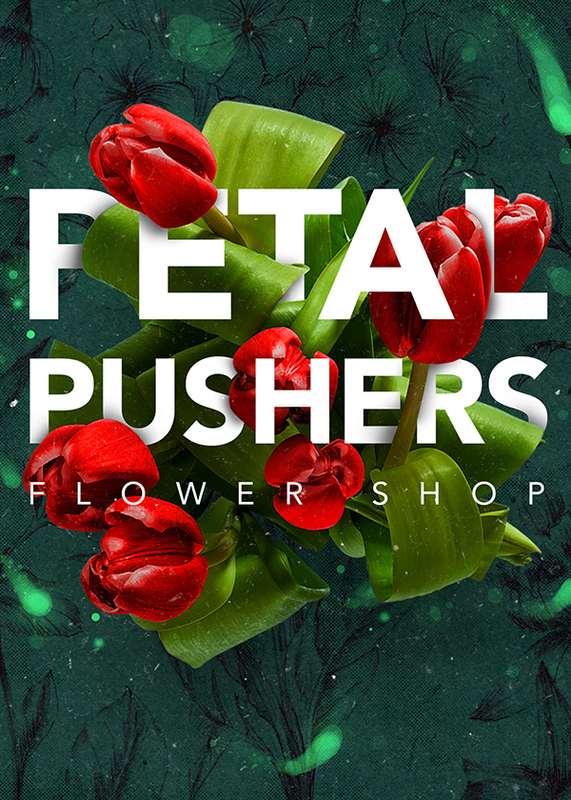 I read “FETAL PUSHERS”. Thought it was a weird sign to make, then I looked closer and noticed it was a P, not an F.
Thanks for the comment on this one and sorry if you misread this one! It is definitely a P though lol :). We hope you enjoy trying out the tutorial though! Such a great tutorial, easy to understand and follow along, nice delivery and fine results. I felt I learned some new tips also. Thanks so much! Thank you so much for this amazing freebie. And another big thank you for all the other great things you provide to us. Aw thanks Andrea- I will let Eric know- he will be so pleased to hear! thank you Design Cuts team! Great tutorial – lots to learn! Awesome feedback! We are so pleased you like this one! You guys always have the BEST tutorials! Not only are they a way to showcase your current bundle’s phenomenal resources, but they expand the participant’s skill & knowledge in a most creative way! Many thanks for another excellent tutorial! Thanks so much Jay and Diana! That is wonderful to hear and I know that Eric will be absolutely delighted to hear your feedback on this one! We always hope that our community will find them useful so we really appreciate your feedback :). Happy designing and please do feel free to share anything that you create with us as we would love to see what you are working on! Our pleasure 🙂 We are so pleased that you like it and we would love to see your finished product if you were keen to share!